The simple answer to this question is that we use a combination of the weather radar and the Mk.1 Eyeball, but the reality is a bit more complicated. Whilst some radar systems can tilt the beam automatically, other setups require pilot input to get a usable picture. Ignoring the height of the beam itself, using the ‘one in sixty rule’, if you can see something sixty miles ahead and the radar is tilted one degree down, it’s approximately one mile (or 6000 feet) below you. Typical tilt during the cruise is 0.5 to 1.5 degrees down. The radar picks up reflected energy, so will detect water droplets, and also the terrain ahead if you tilt it far enough down. The system is quite clever and can calculate the intensity of the droplets present in cloud or rain, and displays this in green, yellow and red. A classic cumulonimbus will have a red core, surrounded by yellow and green bands. 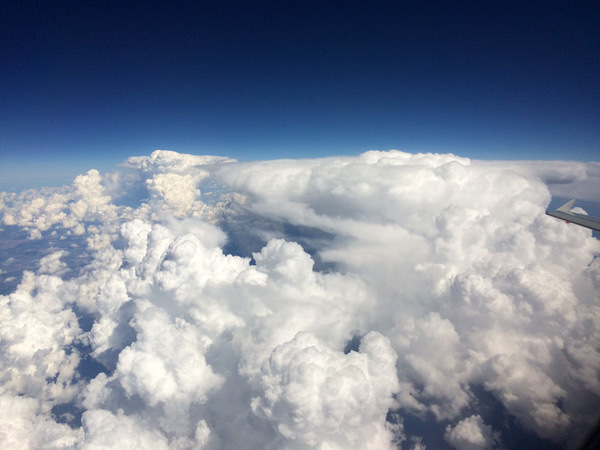 It’s not possible to avoid cloud altogether – a huge cloud bank might be predominantly green, but we’ll always avoid areas we think will be highly active. 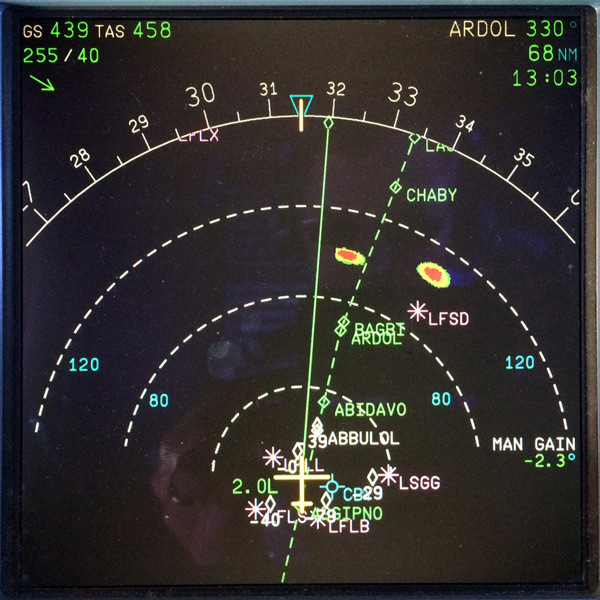 Some radars can detect the movement of the water droplets and will highlight possible windshear in magenta. Not all weather will be detected by the radar though, so it’s important to keep looking outside the aircraft to see anything ahead as early as possible. All of this holds true for the climb, cruise and descent, but once you’re on the STAR (Standard Arrival) for an airfield, things get a bit more complicated. It’s very rare to fly a straight in approach at an airfield – the STAR allows for sequencing of traffic, but also keeps the aircraft clear of any terrain around the airfield. STARs usually have Minimum Safe Altitudes (MSAs) published for each part, so the flight crew know the altitude they can descend to safely. 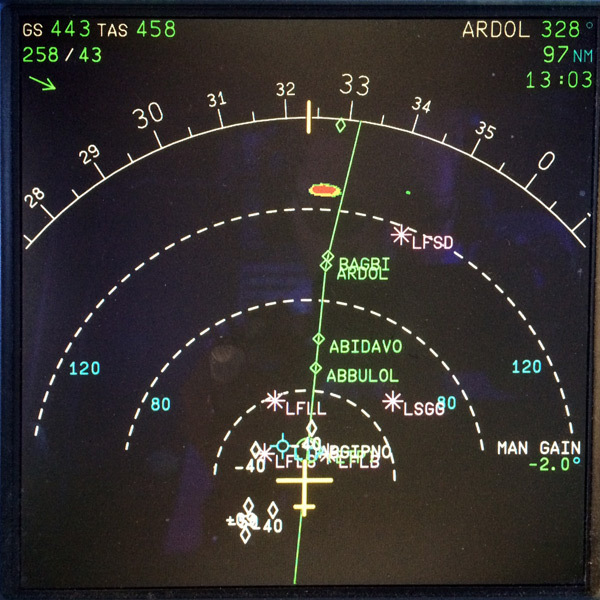 When you request a heading to avoid weather and leave the published STAR, terrain awareness becomes even more critical. 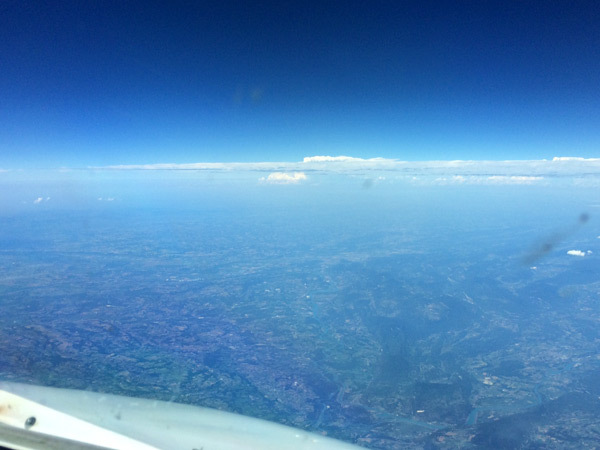 You often have the help of a radar controller who can assist you with descent to radar minima, but terrain separation is ultimately the responsibility of the flight crew. Airfield charts usually show a 25nm radius split into segments showing you the MSA in each part, and a second chart shows the terrain and MSA further out. The aircraft is also fitted with an EGPWS, which allows you to see the terrain around the aircraft on the Navigation Display. On the Airbus, the ND can only show terrain or weather, so usually the Pilot Flying will have the weather displayed, whilst the Pilot Monitoring will have the terrain. The EGPWS will also generate a warning if it calculates the aircraft is too close to the terrain below, which the flight crew must react to. This would indicate a very significant loss of situational awareness by both flight crew and in practice is incredibly rare. Once you have a clear path to the airfield, the last step is to establish on final. This can be closer in than normal if weather is present in the extended centreline, or further out if weather dodging has placed you a long way from the field.